Open a web browser on your computer during net time (Tuesday 8 pm, Sunday 8 am). Bookmark this so you don't have to find the link each week. For the crowds around Portland (CN85) and Seattle (CN87), folks can pretty much hear each other most of the session via radio. So we know which way the net control is pointed, who he's calling, and so forth. But for the stations away from Portland and Seattle, they are truly weak signals for everyone. The spreadsheet is very helpful to find and coordinate these check-ins. You can read the sheet without signing in. But to chat or enter your name, you will need to sign in. In the upper right corner is a Sign In button. Click it and enter your Gmail address. It must be a Gmail address; other accounts like AOL won't work. If you don't have a Gmail address, you can create a free one. You don't even need to ever use it other than for signing in. Guess it's only fair; the spreadsheet is a Google service. You also need to get 'edit' rights, a one-time operation. Click the green "Comment only" button and choose "Request Edit Access". Type your name, callsign, grid square and then click "Send Request." Alternatively, send an e-mail to the sheet owner, Ray W7GLF, asking for an invitation to the spreadsheet. 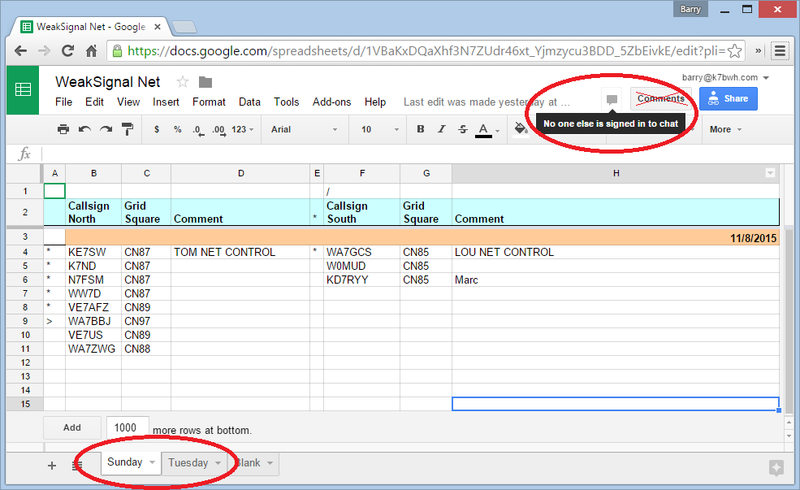 Once you're signed in go to the bottom of the spreadsheet and click on a tab to choose Sunday or Tuesday. Then, back up in the upper right corner, there will be a symbol for Chat. Not to be confused with the other button called Comments. If someone else is logged in, you can click it to begin chatting in the spreadsheet. Click on the Chat symbol and at the lower right of the screen a window will appear. This is the chat box. 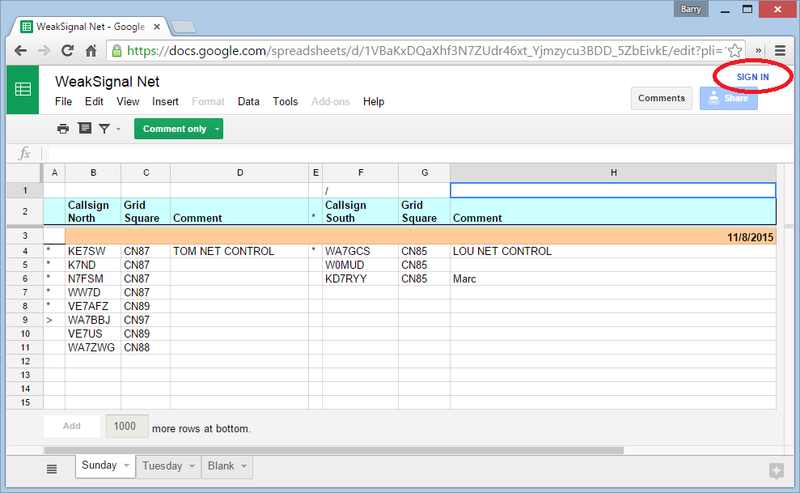 You can text with anyone else signed in to the spreadsheet. For example, on Tuesday evenings you will often see Dale KD7UO along with Jerry K0JJ who is the official net control on Tuesdays. Sometimes other members of the net will sign in, too. Any message you type in the Chat area will instantly be seen by the others. What's great is that if we know you're monitoring during the net, we'll send you a text like, "Bob, listen up, CN85 guys are beaming your direction now." On Tuesdays you'll often see some other guys in the further out grids on the spreadsheet - typical is KG7CCL CN96, Mark VE7AFZ in CN89, K7SC in CN82. Frankly, it makes the net a lot more pleasant than just listening to 45 minutes of background static, wondering if anyone will ever hear you or listen in your direction. Most of the spreadsheet is just that - a spreadsheet. In the top rows above the *** line, are the calls and grids of the stations as they sign in. On Sunday mornings, the net control Ray W7GLF in CN87 does pretty much the same thing. So you can tell at a glance who has checked in, and what order the stations will be calling. And if you use the Chat box, you can get the attention of net control so they'll point your way. Try it out; it works pretty well and is fairly intuitive to use. See you on the net (144.240 MHz on Sundays at 8 am, and Tuesdays at 8 pm).